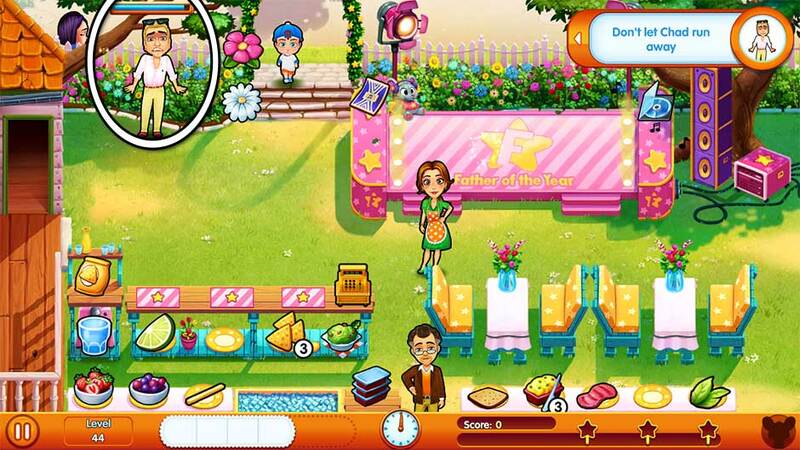 Welcome to the Delicious – Emily’s Moms vs Dads Official Walkthrough. Emily and the moms are about to put Patrick and the dads through the paces of parenthood! Join the entire family and friends as they undergo challenges to see who’s the best once and for all! This is the official walkthrough and contains in-depth strategies, tips and tricks for all levels and challenges. Find all the mouse locations and unlock every trophy. Select a topic from the Contents list below to get started! Welcome to the tips and tricks section of the Delicious – Emily’s Moms vs Dads Official Walkthrough. This section covers all the basics and essentials of the game. 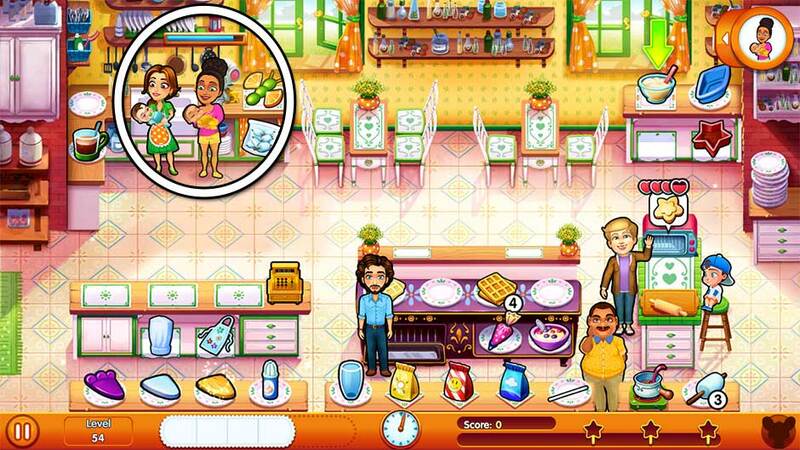 Delicious – Emily’s Moms vs Dads is a time management game. 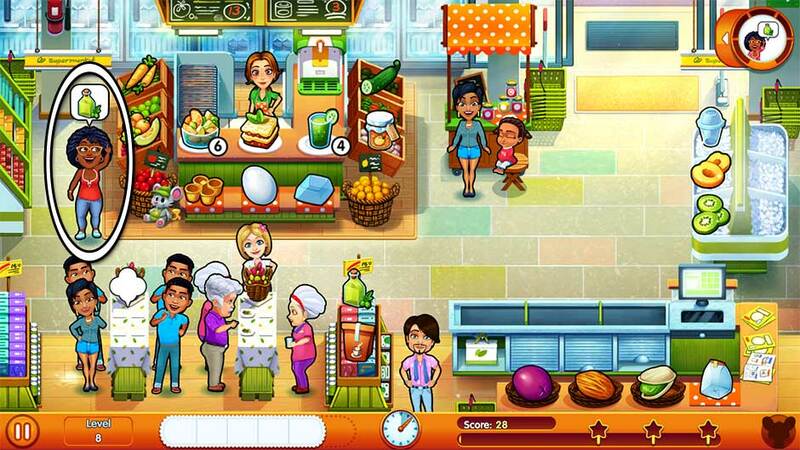 The goal of the game is to serve customers as quickly as possible within a set period of time to earn high scores. When customers enter your shop and are ready to order, a bubble will appear over their head indicating what they’d like. Click on the product the customer asks for, then click on the customer to bring it to them. Once a customer receives the item they’ve asked for, they’ll be ready to pay. Click on the cash register or checkout monitor to check them out. Every customer you serve will have a number of hearts over their head. These hearts indicate how happy your customer is. The more hearts a customer has, the happier they are. Customers with 5 hearts are ecstatic and the happiest possible. The longer you take with an order, or if you get an order wrong, a customer may lose hearts. When a customer loses all their heads, they’ll leave without paying. Angry customers won’t leave tips. Ecstatic customers will leave handsome tips. Serve customers quickly to increase their hearts and earn higher scores! Earn additional score bonuses by serving customers quickly, bringing them all the items they’ve asked for in a single trip, and checking them out in groups at the register. You can also earn bonuses by completing level challenges and objectives. Carl the mouse is hidden in each of the game’s 60 story levels. The mouse will pop up as you play each level, excluding challenges. Every time the mouse appears, you’ll hear a soft squeaking before he disappears again. Find every mouse in levels 1 – 60 and you’ll unlock a special trophy! For a complete list of all the places where mice appear, visit the Mouse Locations section of this walkthrough. Additionally, mouse locations are also listed per level in the walkthrough below. Click “Mouse Location” to be taken directly to a screenshot of all the mouse locations per that chapter. Daily Challenges are a special type of challenge returning to the Delicious franchise. The Daily Challenge can be found at the bottom of the level select screen. Each day, a new Daily Challenge will appear. Click on the Daily Challenge to be given a challenge with a unique character, location, and goal for the day. Complete the Daily Challenge to earn extra diamonds. For every chapter you play, you can purchase upgrades. Upgrades can be purchased at the start of the level, or by selecting the Shop icon on the far left of the level select map for that chapter. Earn money to purchase upgrades by completing levels. The higher your score, the more money you’ll earn! Upgrades offer special bonuses such as increased movement speed, better customer patience, longer mouse appearance times, and more. Clean those tables! – Clean all the tables before the end of a level and you’ll receive a clean table bonus that will be added to your end score for the day. Refill and restock! – Restock any items with limited stock at the beginning of the day to give yourself a head start and advantage when starting a level. Having all items fully stocked at the end of the day will give you an additional score bonus! Diamonds galore! – Complete level objectives and challenges to earn diamonds. Diamonds can be used to upgrade Emily and Patrick’s yard. Daily challenge, daily reward! – Complete the Daily Challenge generated each day to earn extra diamonds and rewards. Mice are everywhere! – Carl the mouse is hiding in each of the game’s story levels. Listen for the squeak and find him before he disappears! Click – Click repeatedly within the circle that appears until it’s filled. Click w/meter – Click within the circle that appears when the needle lands within the green zone. Hold – Click and hold within the circle that appears until it’s completely filled. Rub – Click and hold the small circle that appears, moving your cursor back and forth until the circle is filled. This gesture must be done within the circle or else it won’t count. Drag – Click and hold the circle at the far end of the arrow, then drag it along the length of the arrow until it reaches the end. Multi-task like a master! – You can keep clicking on items and serving customers even when performing touch gestures. 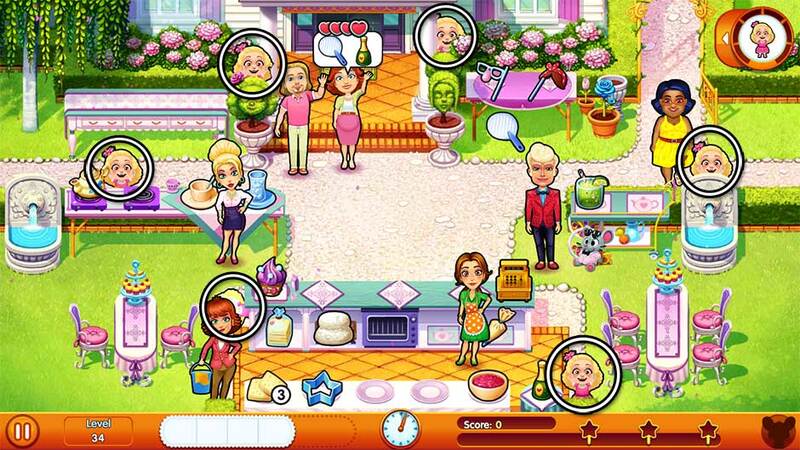 Many levels also feature multiple characters you’ll play at once. It’s all about time management! 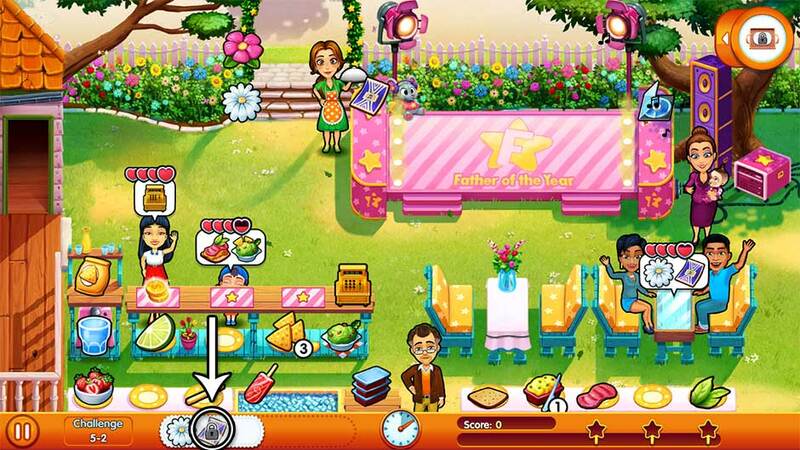 Welcome to the official walkthrough for Delicious – Emily’s Moms vs Dads! This guide covers every aspect of the game – levels, challenges, mice locations, you name it! Scroll up to the Contents above for quick navigation, or continue reading below. Emily’s newborn twins, Emma and Vito Jr., aren’t exactly great sleepers… but Patrick sure is. Mouse Location: At the bottom right corner of the mat, next to the basket of oranges. Today’s level is all about learning the basics. Once a customer orders, click on the item(s) they ask for to bring it to them. Once they’re finished, they’ll move to the register. Click on the checkout monitor to check them out. Don’t forget to click on Carl the Mouse when he appears! Tip! To bag the olives, click on the number of olives the customer asks for, followed by the bag in the bottom right corner. As a new mom, Mary-Lynn could definitely use Emily’s help to get Levi to eat his vegetables! Mouse Location: In the basket of tomatoes at the bottom left corner of the fresh produce counter. Bring food to Levi. Mary-Lynn is holding Levi on the left side of the shop. When Levi’s hungry, a “!” bubble will appear over Mary-Lynn. Click on her to bring food to Levi. You’ll need to do this a total of 4 times today to complete today’s challenge. Do girls mature faster than boys? Help Emily attend to customers quickly so she can deal with her family. Mouse Location: Hanging upside-down from the light above the carrot grill. Get 10 Quick Bonuses today. To earn a Quick Bonus, bring a customer’s full order to them within a handful of seconds of their ordering. New to the shop today are grilled carrots. Click on the carrots in the upper left corner to throw them on the grill. They’ll blink once finished. Be sure to click on them again and add them to your tray before they burn! Tip! Try speeding things up by carrying a pre-prepared item on your tray! It’s good to catch up with Stacy, but her family tends to leave some cleaning up behind! Mouse Location: In the bottom left portion of the ice-cooled table. Clean up the mess left behind in the store. Three “!” bubbles will appear over the areas which need to be cleaned. To clean up a mess, click on it. 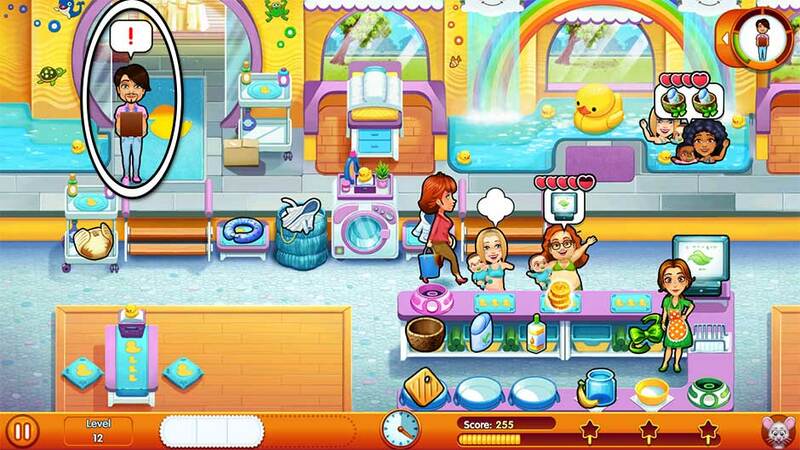 A meter will appear over the mess showing your progress in cleaning it up. Clean up all 3 messes before the end of the day between serving customers to complete today’s challenge. Will the guys survive without the moms? Help Emily prepare some snacks for the spa! Mouse Location: In the basket of oranges at the bottom right corner of the fresh produce counter. Prepare snacks for the spa. There’s a picnic basket on the leftmost table which will need to be filled with snacks. Throughout the day, bubbles displaying various products will appear over this basket. Prepare the product displayed and click on the basket to pack it away. Do this a total of 7 times before the end of the day to complete today’s challenge. What are the girls up to? Try not to burn or spill anything in all the excitement! Mouse Location: Hanging upside-down from the light above the juicer. Don’t burn or spill anything today! The smoothie machine is new to the shop today. 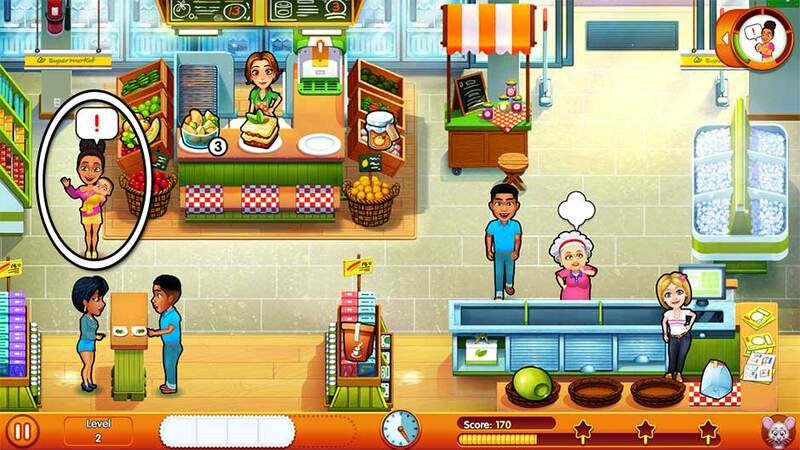 Located on the right side of the fresh produce counter, click on the cucumber to the right to make a smoothie. Click on the smoothie machine once the dial displayed lands in the green zone to top off the glass. Avoid spilling any smoothie or burning any carrots and you’ll complete today’s objective with ease. The contest is coming together! We have the first location sorted – now let’s get some ideas for the first challenge. Mouse Location: Behind the top of the checkout monitor. Hear Mary-Lynn’s ideas throughout the day. Mary-Lynn is standing on the left side of the shop. Every time she has an idea, a “!” bubble will pop up over her head. Click on her to listen to her ideas. You’ll need to do this a total of 5 times today to complete the optional objective and earn a diamond. Don’t worry, Stacy, the girls are here and they know everything about unexpected guests! Mouse Location: At the left corner of the nuts and olives counter, near the green baskets. Serve Stacy her orders. Stacy will show up on the left side of the shop with special orders throughout the day. When an order appears over her head, gather the item and bring it to her. You’ll need to do this 5 times today to complete the optional objective. Sooner or later, sleep deprivation takes its toll on newborn parents… especially from twins. Mouse Location: On the wood floor between the standing tables in the lower left corner. Today’s challenge is to walk less than 200 steps. This objective counts toward both Emily and Nora’s steps combined, so be careful! Serve combos and multiple orders at once to minimize the back-and-forth walking. Emily’s new product couldn’t have been more successful, but new exciting things await! Close the promotion with a bang! Mouse Location: Peeking out from the right side of the awning above the fresh jam stand. Grab 20 smoothies today. To meet this objective, you’ll need to make smoothies constantly throughout the day. Emily can work independently from Nora, which will give you an advantage today. Use the smoothie machine and restock constantly, picking up smoothies as soon as they’re finished. Remove extra smoothies from your tray by clicking on them. Tip! Don’t forget to fully restock your smoothies by the end of the day to earn an added score bonus! It doesn’t matter who we are or where we come from, all our paths lead to… the washing machine. Mouse Location: On the upper floor between the bath and the checkout monitor. Today’s a beautiful day to… do laundry. Both the laundry basket and the washing machine will be marked with a “!” bubble at the start of the day. Click on the laundry to sort it first, followed by the washing machine. A meter will pop up over each displaying your progress. Fully prepare both before the end of the day to earn a diamond. Andy needs to scrub off his past mistakes… We’ll need a ton of detergent for that! Mouse Location: To the right of the left set of stairs, in front of the display table. Receive all the packages from Francois today. Francois will show up with boxes throughout the day. Once he shows up and the “!” bubble appears over his head, click on him to collect the package. You’ll need to do this 4 times today to complete today’s challenge. It’s Mike’s turn to fiddle with the washing machine… prepare for some reparations! Mouse Location: In the center of the wood floor on the left, to the right of the seated table. Repair the washing machine. You won’t be able to restock spa robes until the objective is complete! Click on the washing machine marked with the “!” bubble to work on repairing it. A meter will show up displaying your progress. Once finished, you can once again restock robes, as well as add a shiny diamond to your wardrobe. Chad’s fan base is blowing up! Help Nora manage the excitement. Mouse Location: At the far bottom left corner of the checkout counter, near the basket and bottle warmer. Read the fan comments that appear on the blog today. Nora’s laptop is sitting on a small table on the left in the customer seating area. Click on the computer when the “!” bubble appears to read fan comments. You’ll need to do this 4 times before the end of the day to complete today’s objective. Could a song save Andy when he’s left alone with Levi? Don’t ruin the moment by running out of stock! Mouse Location: Behind the tray with the rubber ducky below the changing table. Don’t run out of stock today! There’s only one item that will need restocked, and that’s the robes next to the washing machine. The small number at the bottom right corner displays how many are currently left in stock. To prepare more, click on the laundry basket next to the washing machine to throw in a garment. Once the washing machine goes through its cycle and blinks, click on the front loader door to restock the robes. Get through the day without stock reaching 0 to earn a diamond for your efforts. Tip! Robes will be a popular item today, so stay on top of that laundry! The word has spread, and now everyone in Snuggford wants to see what’s cooking in the contest. Mouse Location: On the upper floor to the right of the left set of stairs, near the bottom right corner of the entrance mat. Greet the fans! Two fans are standing in the doorway today. A meter will appear over their heads when they require attention. Click on the fan with the meter displayed before it empties. You’ll need to do this throughout the day, but don’t worry – Emily can still go about her normal tasks without being interrupted by the fans, so don’t hesitate to click on them! Mary-Lynn needs to step out in the middle of Mike’s challenge, so we’ll need to sharpen our skills… and our check-outs! Mouse Location: Behind the checkout counter, between the first and second mats to the left of the checkout monitor. Always check out more than one person at a time at the register today. At least 2 customers must be standing at the register with cash register icons above their heads before you can click on the checkout monitor, or else you’ll fail today’s objective. Remember: It’s better to wait! Emergency! Baby in need! Andy, Allison, everybody! Let’s take care of Levi! Mouse Location: In the window behind the large rubber ducky floating in the bath. Serve Levi what he needs today. Levi’s in a pink toddler rocker on the left side of the spa. Throughout the day, order bubbles will pop up over Levi’s head. Bring him the items he needs to calm him down. You’ll need to bring him 12 orders total before the end of the day to complete today’s challenge. Will Andy finally overcome his inexperience? Help out by assembling the pieces of the changer. Mouse Location: On the floor at the upper right corner of the changing table. Find the changer parts scattered around the spa. There are 5 parts total you’ll need to locate before the end of the day. Click on a part to collect it. Their locations are shown below. A little effort always bears fruit. Let’s see how the judges are feeling about the participants! Mouse Location: Behind the baby wipes, between the leftmost pool of water and the entrance mat. Talk with your fellow jury members 5 times today. A “!” bubble will appear over their heads when they want to speak with you. Click on them to talk with them. 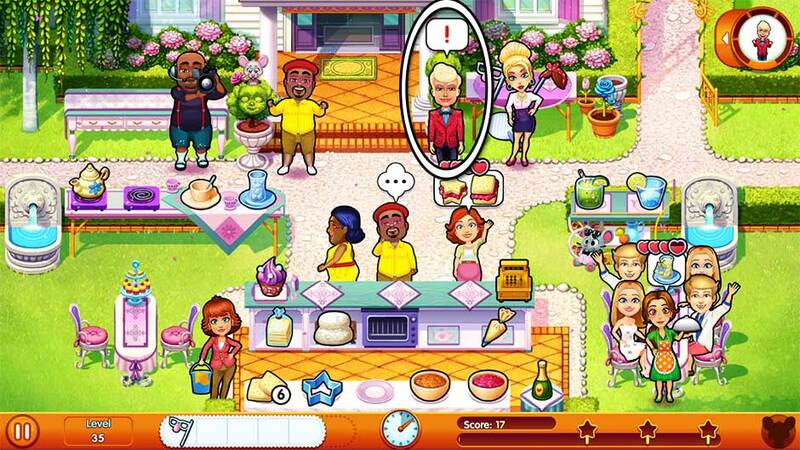 Be aware that every time Emily talks with them, she won’t be serving customers. Try to balance service with conversing with your fellow judges. At the end of the day, you’ll be rewarded with a diamond upon successful completion. The competition’s getting even wilder, as we move to Camp Talon! Help set everything up. Mouse Location: Behind the far-left side of the wooden fence, near the center of the screen. Receive all the packages Francois brings today. Throughout the day, Francois will appear and a “!” bubble will appear over his head. Click on him to collect the box he’s carrying. Repeat this a total of 5 times during the day to complete today’s objective. Additionally, there’s a ring-tailed visitor at the camp you should be very aware of! A sneaky raccoon will sneak into the camp throughout the day, for each level of this chapter. Click on the raccoon to catch him red-handed and chase him off! If you don’t catch the raccoon in time, he’ll help himself to your products! Everything is ready for the new challenge… but the kids ran away in excitement! Find them! Mouse Location: On the grass below the picnic table on the left. Find the children playing hide-and-seek. The children will pop up randomly throughout the day with a laugh. When you hear the tell-tale giggle, quickly locate the child and click on them before they disappear. There are 7 kids you’ll need to find before the end of the day. Their locations are shown below. Tip! You can extend the time you need to find any remaining children at the end of the day by not checking out the final customer(s). 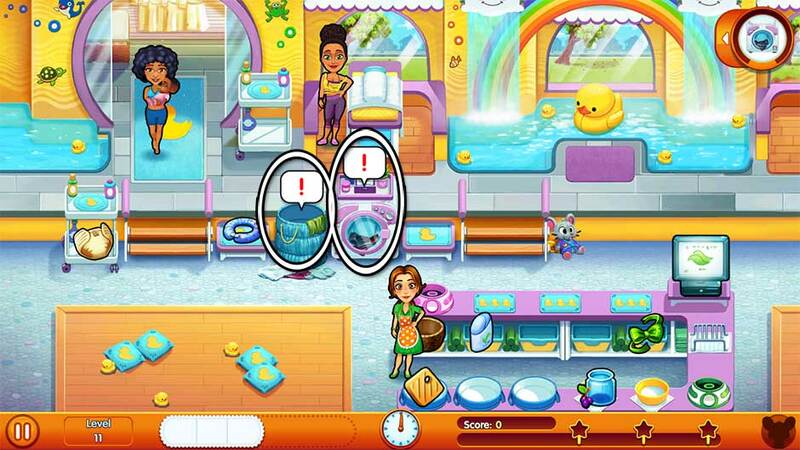 As long as you have at least 1 customer remaining, the children will continue to pop up, buying you extra time. It seems one of the fathers hasn’t paid enough attention to detail… Take care of the mosquito bites! Mouse Location: On the grass between the large tree and the wooden steps on the left. Treat Paige’s mosquito bites. Paige is standing next to the archery target. Throughout the day, a “!” bubble will appear over her head. Click on her when the bubble appears to have Emily help treat her bites. Keep in mind that Emily will leave whatever tasks she’s doing to help Paige, so try to balance this carefully between serving customers. Do this a total of 5 times before the end of the day to complete today’s objective. Breakfast’s ready! It’s Andy’s special recipe, but the gluten-intolerant kids with the blue neckerchiefs can’t eat it! Mouse Location: On the rocks just below the bow and arrows. Don’t serve pancakes to children with blue neckerchiefs today. However, this applies to children only! Adults with blue neckerchiefs can still eat those delicious pancakes. If a child with a blue neckerchief orders pancakes, bring them every item from their order except the pancakes. This will count as serving a full order, whereupon you can check them out at the register as per usual. A new audience appears as Mike faces his worst nightmare: his daughter’s tangled hair. Mouse Location: Behind the upper portion of the cooking spit next to the cash register. Untangle Abigail’s hair 8 times today using the touch gestures that appear. Click, Drag, Hold – whatever it takes! Roast corn is also a new menu item today. 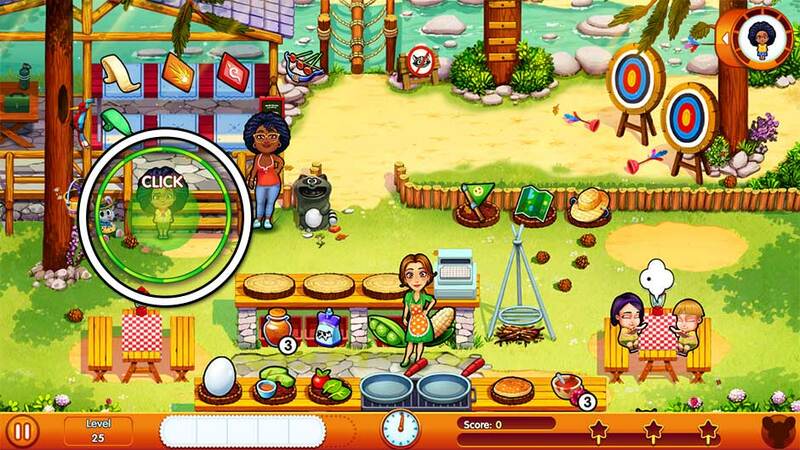 Click on the corn cob beneath the cash register to throw it on the cooking grill. Once finished, it will blink. Make sure to pick it up before it burns! Pancake flippers have a tough life. Let’s help Mike get the perfect flip! Mouse Location: Above the lower right archery target in the upper right corner of the screen. Prepare 20 pancakes today. Each serving will count as a single pancake, even if that serving has more than one pancake in it. Your biggest challenge today will be keeping the berries necessary for pancakes stocked up. Berries will grow at the bottom left and right corners of the screen. Restock them as soon as they’re grown – you’ll need to do this promptly today to complete today’s challenge! Remember you can remove any extra servings on your tray you don’t need by clicking on them. Tip! Unlock blueberry pancakes and add them to the menu before starting today’s level. Blueberry pancakes have a double restocking perk, making the challenge only half as hard. Stacy needs to give Mike a helping hand, by hook or by crook… Just don’t let it get on camera! Mouse Location: Peeking out from the right side of the wooden ladder nailed to the tree at the top of the screen. Don’t let the camera catch Mike! Click on the cameraman whenever the meter appears over his head. You’ll need to click on him before the meter empties, or else he’ll catch Mike. Click on him immediately when the bar appears. Emily can go about her tasks normally regardless, which means the faster you click him, the safer Mike will be. Mike and Stacy have been caught… But they’re not the only ones who’ll end up smelling bad. Mouse Location: Behind the checkout counter, between the first and second mats from the left. Help Bob clean himself off. There are 5 cleaning items scattered around the camp. Locate them as Bob asks for them and bring them to him. Every item you pick up will be added to your tray, so it’s better to only pick up items as they’re asked for. If you need to remove an item from your tray, click on it to return it to the location where it was found. Their locations are shown below. The girls have reached a decision, but Mike has something to say himself… Talk to him to give him courage. Mouse Location: In the stream between the rope log bridge and the tree with the wooden ladder attached. Encourage Mike today. A “!” bubble will appear over his head whenever he needs encouragement. Click on him to bolster his confidence! Each time Stacy comforts Mike, she’ll be temporarily unavailable to help any children with archery. Keep this in mind before you comfort Mike. Bolster him 5 times before the end of the day to complete today’s objective. 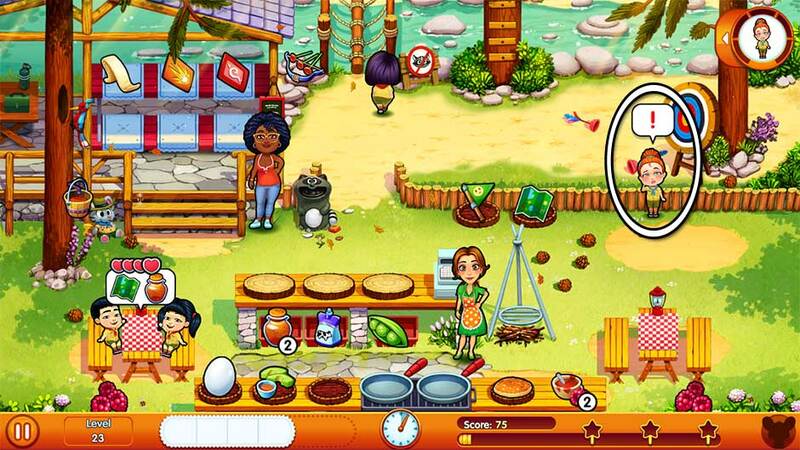 It’s time to know the test results… Leave the campers with a good taste in their mouths. Mouse Location: Hanging upside-down between the wood rafters at the top of the cabin, just below the hanging tree branch. Don’t let anyone’s mood drop under 3 hearts today. Keep items stocked and serve customers full orders as quickly as possible. Tip! If you find yourself struggling, try purchasing an upgrade in the Shop, or switching out items in your menu! Level 31 – Let the Show (Off) Begin! The competition is Sharon’s moment to shine! And what better way to show off than serving customers efficiently? Mouse Location: On the grass between the left dining table and the tea table. Serve customers within 25 seconds of each other and their ordering. Today’s challenge objective is all about being efficient. Most items are straight-forward, with Sharon giving you any masks or fans you ask for. Otherwise, remember to restock bread by clicking on the bagged slices underneath the counter. Can parenthood be taught through blueprints? Help Patrick find the schematics for his kite! Mouse Location: On the right side of the path in the upper right corner, in the gate archway. Find the 5 blueprints scattered around the estate. Their locations are shown below. New today is the teapot. Click on the teapot on the left to begin brewing tea. It’s only while the pot is hot that you’ll be able to serve the beverage. All the contenders are building kites like there’s no tomorrow. Deliver what they ask for! Mouse Location: Between the cart and fountain on the right side of the screen. Note: Mouse can be covered by customers ordering at the right table. Serve the contenders their orders. Chad and Patrick are sitting at the table on the lower left. Both will make orders throughout the day. Be sure to serve them promptly! Serve the men 16 orders total before the end of the day to complete today’s challenge. With all the kids bragging about their parents, Grace can’t help but want more attention. Mouse Location: Behind the top of the cash register. Grace just wants to play! Find Grace in all her hiding places. She’ll hide in 6 different locations, each shown below. Note that if you have Evelyn helping with cleaning, she can block the last location Grace shows up. Either have Evelyn clean a table with a “!” bubble, or carefully click around her until you catch little Grace. The TV show keeps getting traction… Keep up with their updates! Mouse Location: At the top of the leftmost topiary, next to the large hanging sign. Note: Sharon can block the mouse if she’s helping customers take photos. Keep an eye on the TV crew today. Every time a “!” bubble appears over the crew, click on them to have Emily talk with them. Complete this task a total of 5 times today to complete your diamond objective. The tension is so thick you could cut it with a knife… No room for mistakes today. Mouse Location: On the floor below the checkout counter, between the pastry and the jam. Today is all about appearances and perfection. Get through the day without making any mistakes! Don’t spill or burn any products. Pastries are prone to burning and tea can be spilled. Tip! If you need additional help making it through the day, try altering your menu! A delicious cake might sweeten the tension of the kite exhibition. Lend Sharon a hand! Mouse Location: Underneath the table in the upper left corner, just above the footpath. Decorate Sharon’s cake. 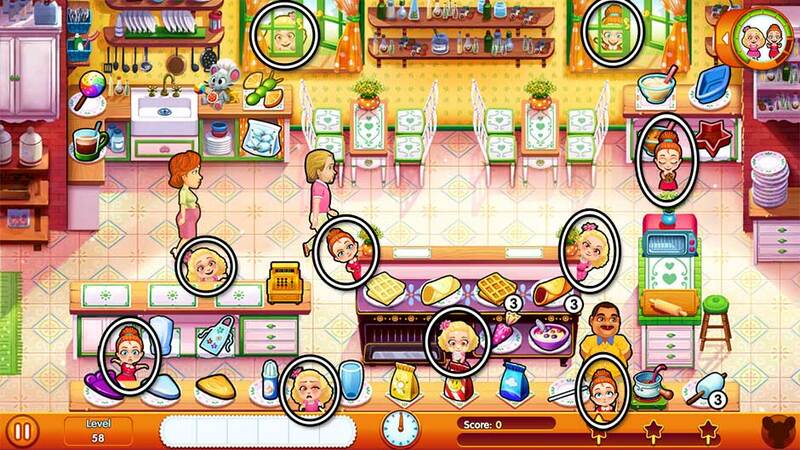 A “!” bubble will appear over the cake in the upper left corner. Click on it to have Sharon decorate it. 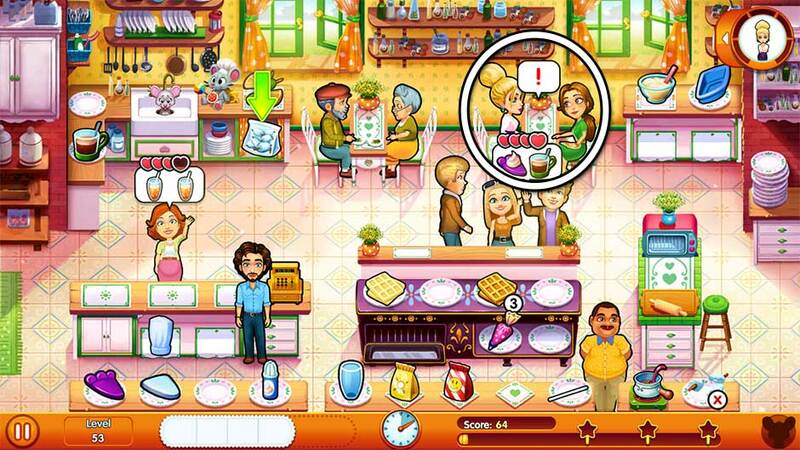 Sharon will be kept busy while decorating, while Emily will be able to move around and serve customers as per normal. If Sharon needs to help her serve, she’ll pause her progress on the cake. 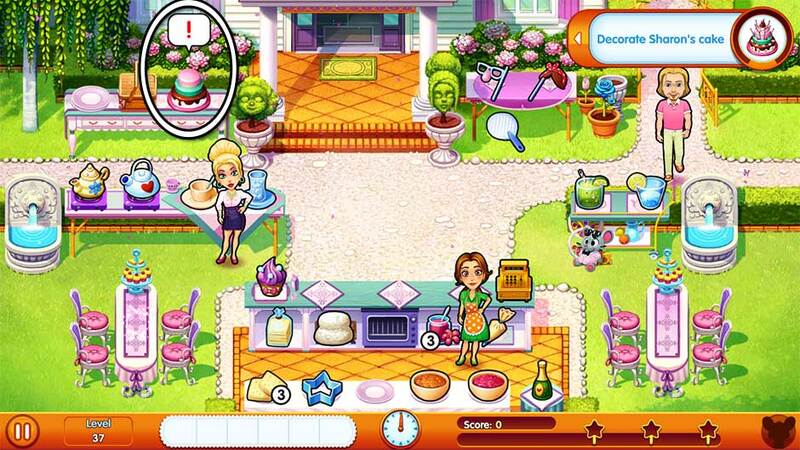 Click on the cake once she’s finished serving customers to have her continue decorating. Complete the cake before the end of the day to earn a diamond. Is there a way to save the topiary? Help Patrick by handing him the tools he needs. Mouse Location: Behind the top of the small hedge in the lower right corner, next to the champagne. Pass Patrick the tools he needs today. There are 5 tools scattered around the area. Find them and give them to Patrick as he asks for them. Every tool you pick up will be added to your tray, so it’s best to only pick them up once asked for. If you need to free up tray space, click on the tool to remove it, placing it back in the location where it was found. The 5 tool locations are pictured below. Mouse Location: In the roses beneath the right window of the manor, above the mask table. Don’t make Sharon walk more than necessary today. A meter in the upper right corner of the screen will help you keep track of Sharon’s steps. This objective does not affect Emily, only Sharon. Tip! Try keeping an extra cup of tea on your tray to minimize Sharon’s walking. The breeze at the beach, a little chat with a friend, and ideas just start flowing for Sharon. Mouse Location: At the far-left corner of the hedge in the upper left corner of the screen, hiding behind the willow fronds. Listen to Sharon’s ideas. Every time Sharon has an idea, a “!” bubble will appear over her head. Click on Sharon to listen to her idea. You’ll need to do this a total of 5 times today to complete today’s challenge. At the O’Malley’s, everyone drools over the twins! Until they breath deep, fill up their lungs and… Don’t let that happen! Mouse Location: Behind the lower right side of the rose archway. Take care of Vito Jr. today. The baby boy’s in an infant swing on the left side of the garden. Every time a “!” bubble appears over him, quickly click on Vito Jr. to calm him. Repeat this a total of 4 times today to complete today’s objective. Sharon’s presenting her idea for the final challenge. It’s time to build the stage! Mouse Location: On the grass in the upper left corner of the garden. Today’s objective is to prepare the stage. Two stage lights are marked with a “!” bubble at the start of the day. Click on a light to prepare it. You’ll need to finish preparing both before the end of the day to complete today’s objective. Tip! Prepare popsicles early in the day to save time later. As Mike prepares his answer, the competition is getting even more popular! Be efficient with your trays! Mouse Location: On the grass just beneath the center of the stage, centered between the steps. Serve 6 full trays of items today. Your tray has 3 slots. 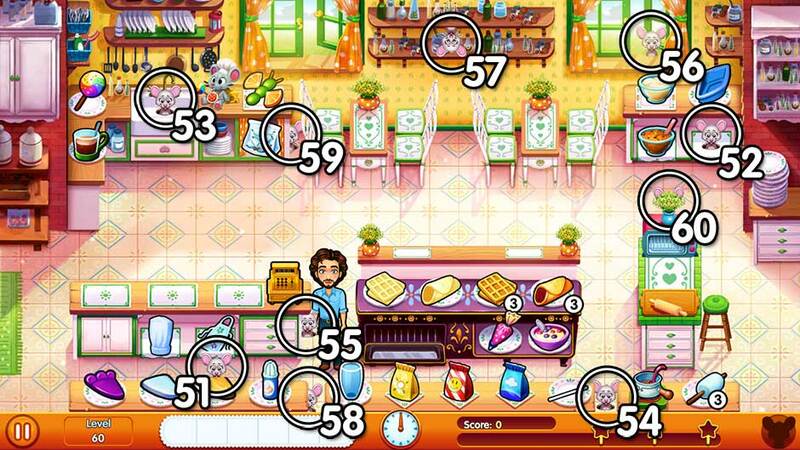 You’ll need to serve those items back-to-back to clear the tray. Repeat this a total of 6 times today to earn a glittering diamond. Tip! Only serve orders once your tray is full! Chad is nervous? There’s a first time for everything… Don’t let the star of the show break down! Mouse Location: On top of the large star on the far-right side of the stage, beneath the CDs. Don’t let Chad run away today! Chad is standing in the upper left corner of the garden. Each time the meter appears over his head, click on him to prevent him from leaving. The longer you wait, the more likely he is to start moving. Click on him as quickly as possible once the bar appears. Repeat this throughout the day to earn a diamond as bright as his smile. Collect the question cards scattered throughout the yard. There are 7 in total. Their locations are shown below. Something’s wrong with the twins… but will Patrick realize? Help them fix it! Mouse Location: Behind the left side of the checkout counter, above the bag of chips. Change the babies’ outfits. A “!” will appear over the infants at the start of the day. Click on them to change their clothing. Changing the children requires Emily’s full attention, so work at their outfits every spare moment you’re not serving customers to keep on top of today’s task. Time to make it up and clean it down! Help Patrick keep all goods in stock. Mouse Location: On the grass below the first table in the lower right corner, closest to the cash register. Don’t run out of stock on any items today. Stocked items include chips and sandwich spread. To restock the chips, click on the chip bag on the left above the glass. To restock the spread, click on the stack of boat trays next to the ice. Complete the day without stock ever reaching 0 to earn a diamond. Tip! Restock both fully before the end of the day to earn an additional score bonus! It’s the most anticipated daddy sumo battle in recent history, but is Patrick game? Gather all the materials! Mouse Location: Behind the popsicle stand immediately below the cash register. Receive the sumo materials from Francois. Francois will appear several times today carrying boxes containing supplies. Whenever a “!” bubble appears over his head, click on him to collect the materials. Repeat this a total of 5 times today to earn today’s diamond. 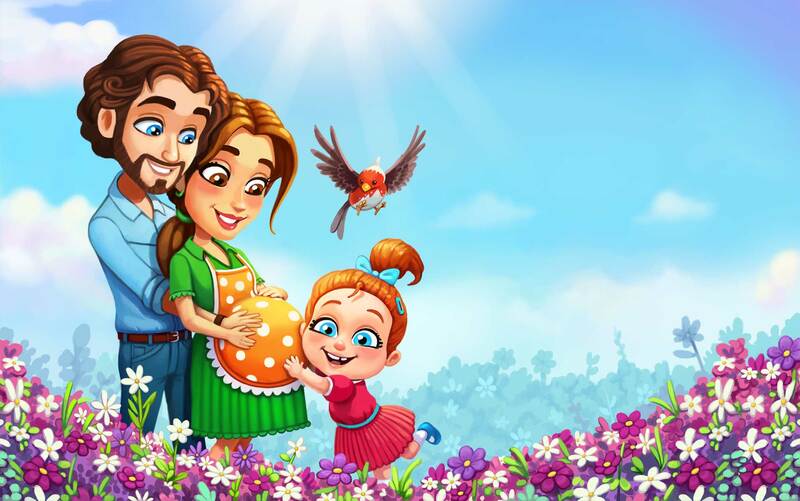 Level 49 – Daddy to the Rescue! Can the love of a child put an end to any battle? Keep the good vibes up! Mouse Location: Behind the left side of the hedge of plants in the upper left corner, below the large tree branch. Note: Orders from the upper left table can partially block the mouse from view. Don’t let the customers’ patience drop below 3 hearts at any point today. Serve customers full orders quickly to improve their patience. You can also upgrade your Shop or menu to improve patience! Is the competition over? Bob seems to have some ‘creative differences’ with the gang, kick him out! Mouse Location: Hanging upside-down from the left stage spotlight. Get Bob out of here! Click on Bob whenever a “!” bubble appears over his head to shoo him away. You’ll need to do this a total of 4 times today before he’ll finally be out of your hair for good. This location introduces a unique product: the mixed drink. Depending on the color drink customers order, you’ll need to mix different colored powders together. The following is a table of powder colors and the drink mix they’ll create when combined. Father-daughter quality time with extra sugar. Prepare the oven for these guys! Mouse Location: Behind the third plate from the left of the bottom leftmost counter. Today’s task is to prepare the oven. The oven is on the right, marked with a “!” bubble. Click on the oven to prep it. 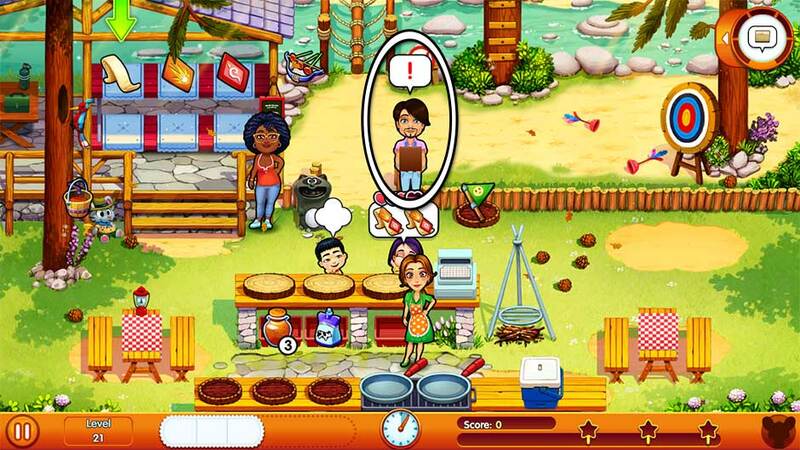 Patrick will be busy while he’s working on it, so try to balance prepping the oven with catering to customers. Complete preparations before the end of the day to earn a diamond. Tip! Keep at least 1 yellow soda pop on your tray to save time with incoming customers. Mike is going to cook!? All kitchen protocols enabled! Get him what he needs! Mouse Location: On the cloth placemat underneath the blue batter tray on the upper right. Bring Mike the items he needs today. Mike will stand in the upper left corner of the kitchen. Every time he needs an item, an order bubble will pop up over his head. Bring him the item he needs. You’ll need to repeat this task a total of 7 times today to complete the objective. Love might fly in and out, but a good friend stays forever. Cheer up Sharon! Mouse Location: In the sink in the upper left corner. Cheer up Sharon. Sharon and Emily will spend the day sitting at the table on the upper right. Each time a “!” appears over them, click on them to have Emily cheer her up. Patrick will continue to work independently of Emily, so no time will be wasted clicking on them right away. Cheer up Sharon a total of 5 times to complete today’s challenge. Can you ever go wrong if you listen to your heart? Keep Levi entertained! Mouse Location: Between the center and bottom right counters, next to the fondue pot. Note: If you have Mike helping clean, he can completely block the mouse. Only by cleaning a table when the mouse appears will he move out of the way. Keep Levi entertained. 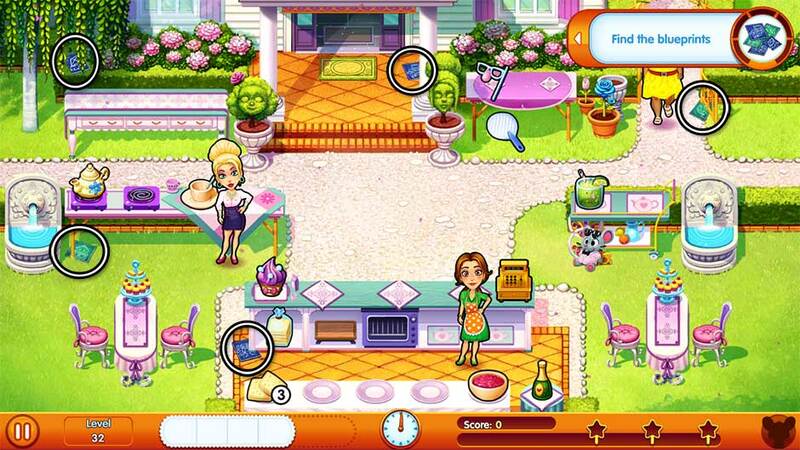 Mary-Lynn is standing near the sink on the upper left. Each time a meter appears over her, click on her before it empties. You’ll need to repeat this task throughout the day to earn today’s diamond. What big surprise is waiting for Mary-Lynn? Maybe some food will help her and Andy reconcile! Mouse Location: On the floor at the right side of the checkout counter, just below the cash register. Take Mary-Lynn and Andy’s orders. The two will be standing at the counter behind the oven for the entire day. Serve them a total of 20 orders they’ll ask for to earn today’s diamond. Tip! Serve these two before other customers to keep their patience up! You can also purchase upgrades or improve your menu to help with increasing patience. Patrick has resolved to prove he’s learned his lesson… Make his life easier by not burning anything! Mouse Location: In the upper right window, above the batter mixes. Don’t burn any pastries today! Restocking waffles and cannolis both require the oven, and both risk burning if you don’t take them out quickly! Make it through the day without burning anything and you’ll earn a diamond for top-notch effort. Tip! Purchase the Modern Oven upgrade in the Shop to increase the amount of time that passes before the pastries risk burning. Patrick and Chad might end up finding some common ground… or some common tables to clean. Mouse Location: Hanging upside-down from the center of the spice shelf hanging on the wall between the windows. Clean 3 tables in a row a total of 3 times. This challenge is tricky. Chances are you’re used to cleaning tables right away. Now whenever you see the “!” bubble appear: Wait! Don’t start cleaning tables until there are at least 3 in need of cleaning. Then click on all the tables back-to-back to clean them. Repeat this a total of 3 times to complete today’s challenge and have those tables shining like diamonds. Tip! This challenge doesn’t just apply to tables. Any dirty surface with a “!” bubble counts! Children have a sixth sense for surprises! Catch Grace and Paige before they discover Chad. Mouse Location: On the floor between the bottom left and center counters, between the whipped cream and the glass. Find Grace and Paige. These two are playing hide and seek all over the kitchen today. Every time you hear a giggle, one of them has appeared! Quickly find and click on them before they disappear again. You’ll need to find the mischievous duo 10 times today to complete today’s challenge. The locations where they show up are pictured below. We still don’t know if girls mature faster than boys, but they both need love. Sooth Emmy this time! Mouse Location: On the floor behind the right side of the sink counter, between the bag of marshmallows and the dining table. Avoid a crying outburst. Emmy is the culprit today, and she’s sitting in a baby swing beneath the sink. As soon as a meter appears over her head, click on her – fast! The meter empties very quickly. If the meter empties, little Emmy will cry. Prevent the little one from having an outburst for the entirety of today and you’ll earn a diamond. Really, you’ll deserve it after today! A delicious meal can bring any family together! Give them the ingredients they need. Mouse Location: Hiding behind the plant in the small blue vase on top of the small oven on the right. Note: Customers at the baking station will block the mouse from view as long as they are there. Prepare food for the barbecue. Various family and friends will enter the kitchen with a food order today. Bring them the item they ask for. Repeat this for all 8 food items requested to complete today’s objective. Congratulations! 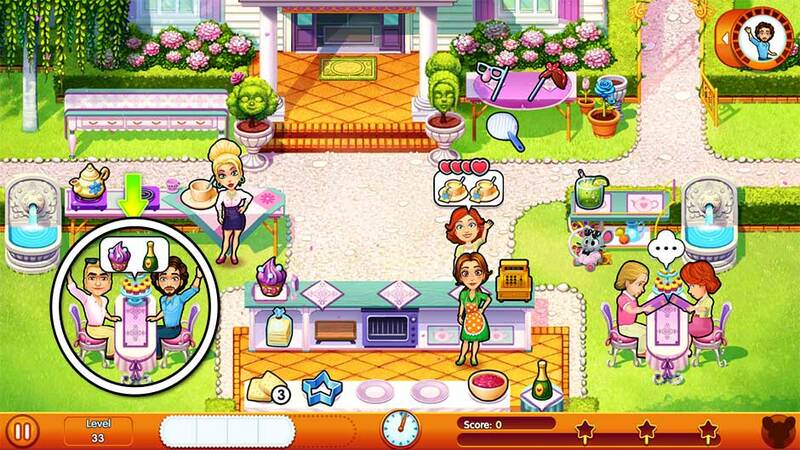 You’ve completed Delicious – Emily’s Moms vs Dads Platinum Edition! 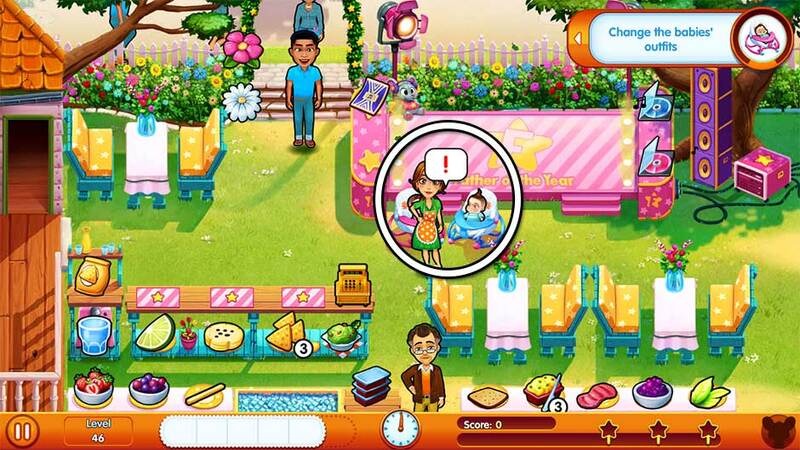 Many challenges await in Delicious – Emily’s Moms vs Dads, including 30 challenge levels. These special challenge levels are spread throughout each chapter. Each level requires you to complete a unique objective. For more information on Daily Challenges, visit the General Tips & Tricks section. 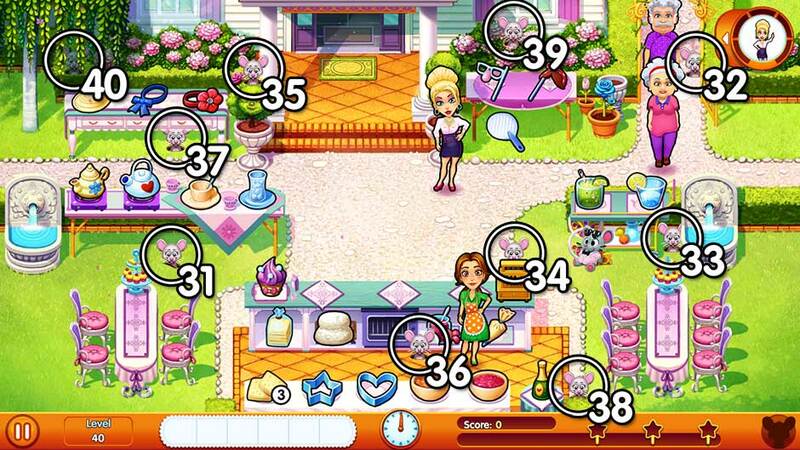 All other challenge levels can be found in this section of the Delicious – Emily’s Moms vs Dads Official Walkthrough. 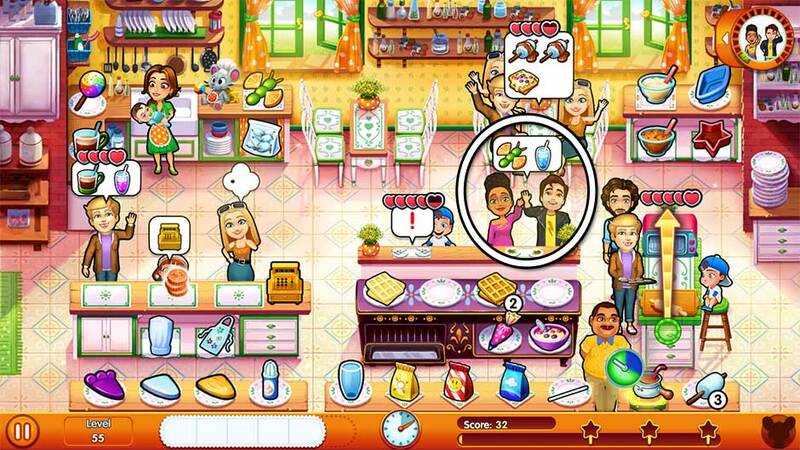 Here’s a restaurateur’s trick for stressful days: check-out multiple customers at once! Check out multiple customers at once, 3 times. Make sure to have at least 2 customers waiting at the register before you use the checkout monitor. Do this 3 times to complete today’s challenge. Help Emily get some extra money to buy some treats for the kids! Earn 300 in tips. Serve complete orders quickly to earn bonus tips that will be added to your score. Checking out multiple customers at once will also add a nice tip to top off your score. Tip! Try investing in various upgrades and menu changes to help increase your tips. 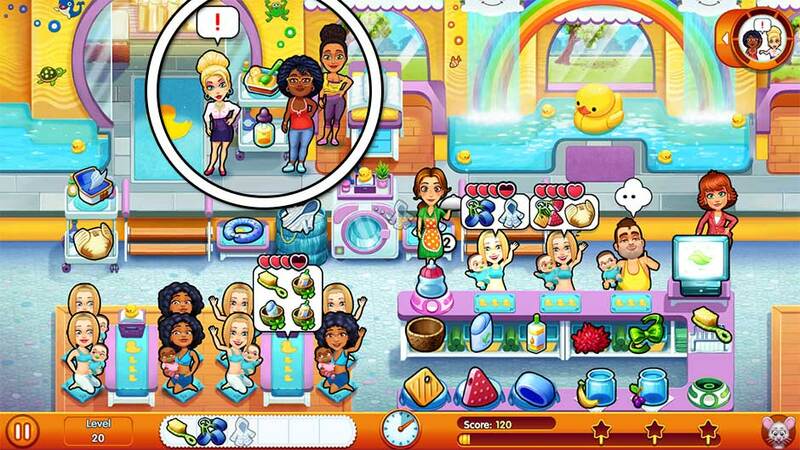 The competition, the supermarket, the twins… Emily and Nora are definitely overworked! Emily and Nora are both tired. Both will take longer to move and prepare items today. It’s best to restock items and prepare at the very start of the day. If you find yourself struggling, there are patience upgrades available in the Shop that will help today. Like our grandmas would say… an ounce of prevention is worth a pound of cure. Don’t run out of stock today. Smoothies and fruit salads are both items with limited stock. A number at the lower right corner of each item will display their current stock. Emily will be in charge of restocking these items. Both will be popular today to add to the challenge. Remember – it’s always better to keep a customer waiting while you restock than to run out! Life is risky. Check out customers when a heart is shaking. Check out customers at the last possible moment when the heart above their head is shaking. Carefully watch the hearts above a customer’s head once the money icon appears. When a heart is almost empty, it will begin to shake. Click on the checkout monitor to check out the customer right at the last moment. You’ll need to repeat this 10 times to complete today’s challenge. Tip! The shaking heart applies to any level of customer happiness. For example – a customer with 5 hearts and the fifth heart shaking, or a customer with 4 hearts and the fourth heart shaking. We need to live up to expectations! Serve 17 ecstatic customers. Serve 17 ecstatic customers today. To make a customer ecstatic, bring a customer with 4 hearts their full order before they lose any hearts. If you do this successfully, that customer will earn another heart and become ecstatic, adding toward the total of today’s goal. The contest is getting so exciting, customers want to get back to it as soon as possible. Work quicker! Get 17 quick bonuses. Earn quick bonuses by bringing a customer their full order within a handful of seconds of their ordering. To help with today’s challenge, try carrying an extra of a popular item that takes longer to prepare on your tray. For example, baby food. Everybody’s ready to make the most out of the contest. Don’t you dare stop for even a second! Don’t stand still for longer than 8 seconds today. The easiest way to keep Emily moving is to alternate clicking between two locations. We recommend clicking between the checkout monitor and the green bow below it. Not only will this prevent any excess walking on Emily’s part, it’ll also prevent any unwanted items building up on your tray. Sometimes it seems everything’s against you, even the trays are falling apart! Work with a breaking tray. You’ll start the day off with 5 slots, and by the end of the day, you’ll only have 1! It’s important to get as many combos as possible at the start of the day. By the end of the day, you’ll have to make multiple trips per order. With all the competition around them, customers get distracted and confuse their orders. Don’t let a customer drop below 3 hearts today. Try preparing orders as soon as a customer orders and don’t worry too much about combos. If you need to increase your customers’ patience, check out the Shop! Tip! Don’t keep customers waiting too long at the register today. Check them out before their hearts empty! Chain the customers up to the taste of our delicious food! Serve 6 orders in a row. Each time you serve 2 orders back-to-back, you’ll earn a tally toward today’s challenge objective. Successfully serve at least 2 orders in a row back-to-back, 6 times today to complete today’s challenge. Tip! Children at the archery targets count toward today’s challenge. Let’s serve it the way great waiters do! Everything at once. Serve only full orders. To complete today’s challenge, you’ll have to bring every customer all the items they ask for in a single trip. If you find this challenge difficult, focus on serving only 1 customer at a time. The kids are starving after an exciting day at the camp. Feed them double orders! Table customers will order twice today. It’s especially important to keep your items properly stocked today. Remember that there’s only 1 set of hearts per each table of customers, so serving them quickly is a must! 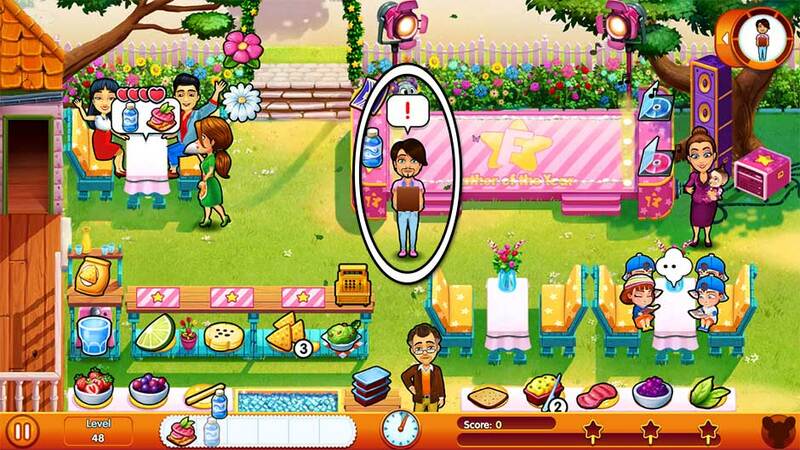 Place emphasis on serving table customers first when ordering to achieve the highest scores. Beware: an exciting day at the camp may cause hyperactivity, fatigue, and selective amnesia. Customers will forget their orders today. After a customer orders and a short period of time passes, their order will be replaced with a “?” bubble. The best strategy to use today is to prepare orders as soon as they’re ordered. This will prevent a lot of confusion long-term. If you find yourself falling behind, focus on serving newer customers first, whose orders you’re sure of. How can you be sure you got it right? By making every product twice! Make each product twice today. This is one of the toughest challenges. Every time you make a product, you’ll need to make 2 of it in a row. For example, if a customer orders pancakes and eggs, you’ll need to make 2 pancake orders, followed by 2 eggs, exactly how the customer asked for it. Items such as flags and badges are included – you must pick up 2 in a row or else you’ll fail today’s challenge. If you find yourself struggling today, invest in items that help increase patience in the Shop. Otherwise, remember that any extra items you make can be kept on your tray for later. For example, if you pick up 2 flags and keep 1 on your tray, and a customer asks for a flag, you can serve that leftover flag on your tray without having to pick up any new ones. The cash register is broken, and the repairman is on holiday… We’ll just have to make do! The cash register will break throughout the day. Every time this happens, an empty meter will appear over it. Click on the cash register to fix it. You’ll need to fix it completely before you can use it again. The best strategy to use today is to only fix the cash register as needed. Don’t waste any more time than necessary. Make 22 cups of tea. Make 22 cups of tea today. Click on the pot on the left to boil the water. Once the needle lands in the green zone, you’ll be able to make tea. Click on the kettle, followed by the tea cup to make a cup of tea. The best strategy to use is to make as many as possible in a single go when the kettle is warm enough. Try to make tea in batches of 4 at least. Remember to cross any extra cups of tea you no longer want off your tray! You’ll need to do this to add more items to your tray. No matter how stressful it gets, take a moment to have a deep breath, and don’t move for 30 seconds. Don’t move for 30 seconds. The best opportunity to do this is at the very start and the very end of the day. The start of the day: Don’t move at all once the day starts. Approximately 2 tables of customers will arrive before you complete the challenge. The end of the day: Check out every customer except the very last one! Hold still for 30 seconds until you complete the challenge, then check out the final customer. All the fuss is taking its toll on Emily. Emily is tired today. All her movements and preparation times will be extended. Take this into account and restock everything at the start of the day. If you find yourself struggling, try upgrading your Shop and menu to include items that will increase customer patience. Products will fall off your tray today! Keep a close eye on your tray between preparing items and bringing them to customers. While full orders are great for your score, you may want to make quicker trips today to avoid disaster. It’s what gives food that extra something! Deliver 15 products that were already on your tray. Deliver 15 products that are already on the tray. Pre-make items today and keep one of each on your tray – popsicle, bread with spread, and ticket. Remove any items from your tray as needed to pick up any you may be missing. If you keep these three on your tray, however, the chances of having an item a customer wants are very high. Remember – to count, the item must be made before the customer orders it! The twins have developed a habit of leaving toys on Emily’s tray. Work with blocked tray slots! Work with blocked tray slots. A lock icon will show up over the middle (second) slot of your tray today. This means whatever the second item is on your tray, you won’t be able to serve it! Take this into consideration as you play. Only the first and third items on your tray can be served. That means no full orders today! Tip! 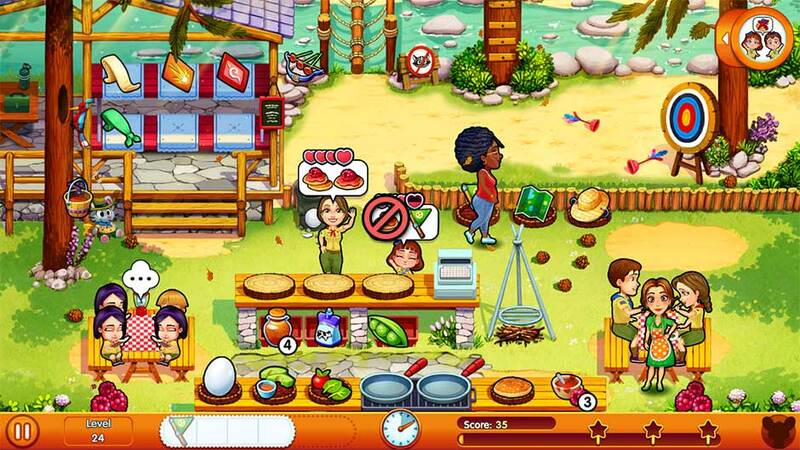 You can still remove any item from your tray, but remember – any item in the second slot cannot be served. Serving the first item will move the second item to the first slot. Fresh and frozen – that’s how food should always be served! Don’t let any product melt today. That means popsicles! Be especially careful when adding popsicles to your tray. Serve them right away – don’t take your time, or else they’ll melt. Tip! You can still pre-make popsicles and leave them on ice without worrying about them melting. You can also cross them off your tray before they melt without risking losing today’s challenge. It’s time for the Fresh Product Challenge! Deliver the products before they go bad! This applies to any item pictured in the upper right corner of today’s challenge. As soon as a fresh item is added to your tray, it’ll go bad within a handful of seconds. If there’s a fresh product on your tray, don’t worry about combos. Instead, serve that fresh item right away to prevent it from going bad. Tip! Melted popsicles will not count against you in today’s challenge. It’s scientifically proven: charging three customers at once is always more satisfying. Check out 3 customers at once, a total of 4 times today. Investing in upgrades that increase patience, or an entertainer, will help keep customers patient while you rack up those combos at the register. Help Patrick finish quickly so he can spend time with the twins. Get 3 quick bonuses in a row! Get 3 quick bonuses in a row. If you serve an order that isn’t a quick bonus, any progress you’ve made will be erased and you’ll have to start over. Cakes will be especially popular orders today. Pay close attention to the number of layers a customer asks for and bring their items quickly! Tip! You can still check out customers at the register and save any progress you’ve made toward today’s challenge. Patrick’s feeling confident today: don’t throw away or burn any products! Don’t make any mistakes today. There’s two parts to this challenge: 1) Don’t burn any products today when using the oven. 2) Don’t remove any items from your tray. Serve only perfect orders. If you start to fall behind, don’t panic! If you get the orders right, you’ll complete today’s challenge with ease. Test your brain, and finish the shift without seeing what you’re carrying on the tray. Today’s challenge is to work with a mystery tray! 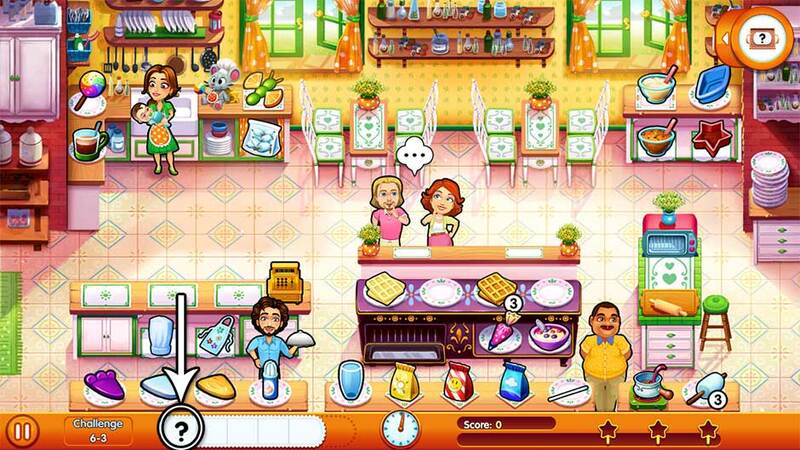 As soon as you’ve finished preparing an item and it goes onto your tray, that item will turn into a “?”. You must then take it to the correct customer. Pay extra close attention while preparing items today. You’ll still be able to see an outline of the item you’re making before it turns into a finished “?” on your tray. If history has taught us anything, it’s that dirty tables are bad news. Clean the tables before 10 seconds pass. Never leave a table dirty for longer than 10 seconds. Having Mike help you clean today is essential to keep on top of things. The moment a table displays a “!” bubble over it, click on it immediately. The table needs to be cleaned within 10 seconds, and it takes at least a few seconds to move to the actual table and clean it. It’s important to teach the twins good values. Serve everyone in the order they come in. Serve customers in the order they come in. Pay close attention to customers entering from the left: That’s the order in which you must serve them today. Even if another customer orders first, you’ll need to serve the customers in the order which they entered in. Congratulations! You’ve completed all the challenges! Moms vs Dads – versus mice! Carl the mouse is hidden in each of the game’s 60 story levels. This section of the Delicious – Emily’s Moms vs Dads walkthrough lists every level and location where Carl can be found. Level 1: At the bottom right corner of the mat, next to the basket of oranges. Level 2: In the basket of tomatoes at the bottom left corner of the fresh produce counter. Level 3: Hanging upside-down from the light above the carrot grill. Level 4: In the bottom left portion of the ice-cooled table. 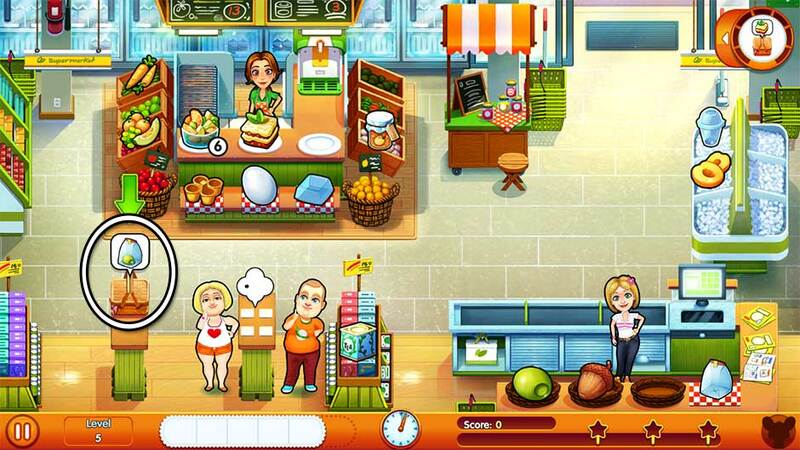 Level 5: In the basket of oranges at the bottom right corner of the fresh produce counter. Level 6: Hanging upside-down from the light above the juicer. Level 7: Behind the top of the checkout monitor. 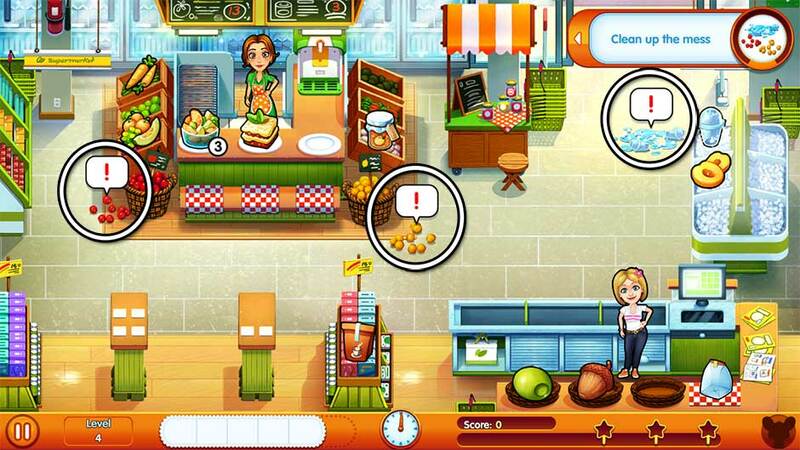 Level 8: At the left corner of the nuts and olives counter, near the green baskets. Level 9: On the wood floor between the standing tables in the lower left corner. Level 10: Peeking out from the right side of the awning above the fresh jam stand. Level 11: On the upper floor between the bath and the checkout monitor. Level 12: To the right of the left set of stairs, in front of the display table. Level 13: In the center of the wood floor on the left, to the right of the seated table. 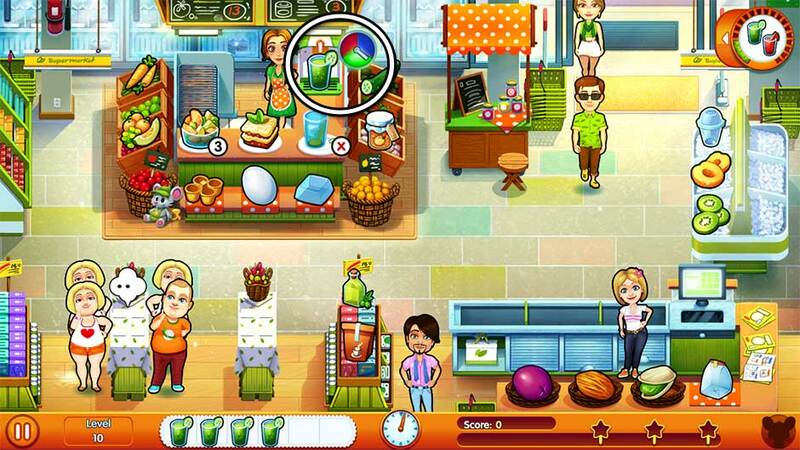 Level 14: At the far bottom left corner of the checkout counter, near the basket and bottle warmer. 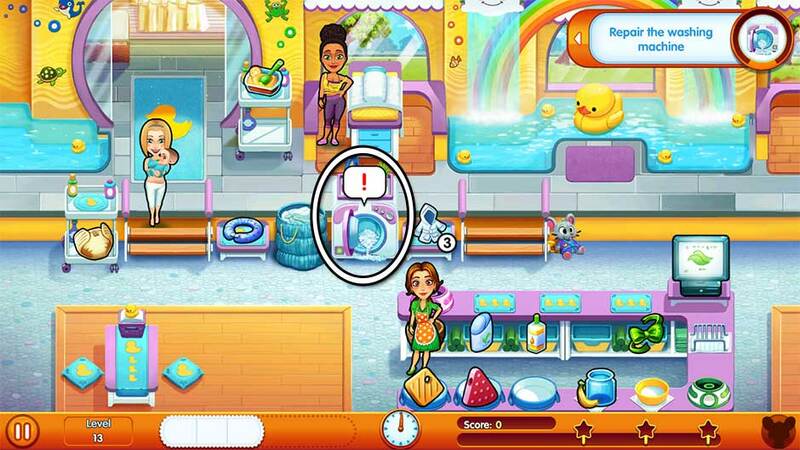 Level 15: Behind the tray with the rubber ducky below the changing table. Level 16: On the upper floor to the right of the left set of stairs, near the bottom right corner of the entrance mat. Level 17: Behind the checkout counter, between the first and second mats to the left of the checkout monitor. 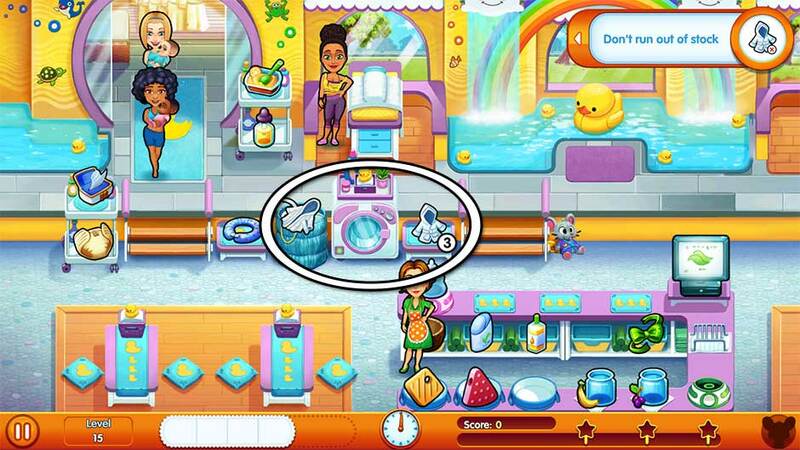 Level 18: In the window behind the large rubber ducky floating in the bath. 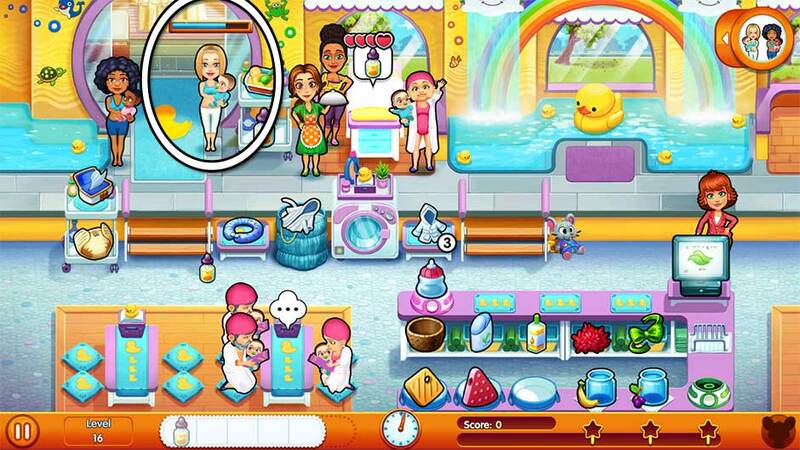 Level 19: On the floor at the upper right corner of the changing table. Level 20: Behind the baby wipes, between the leftmost pool of water and the entrance mat. Level 21: Behind the far-left side of the wooden fence, near the center of the screen. Level 22: On the grass below the picnic table on the left. Level 23: On the grass between the large tree and the wooden steps on the left. Level 24: On the rocks just below the bow and arrows. Level 25: Behind the upper portion of the cooking spit next to the cash register. 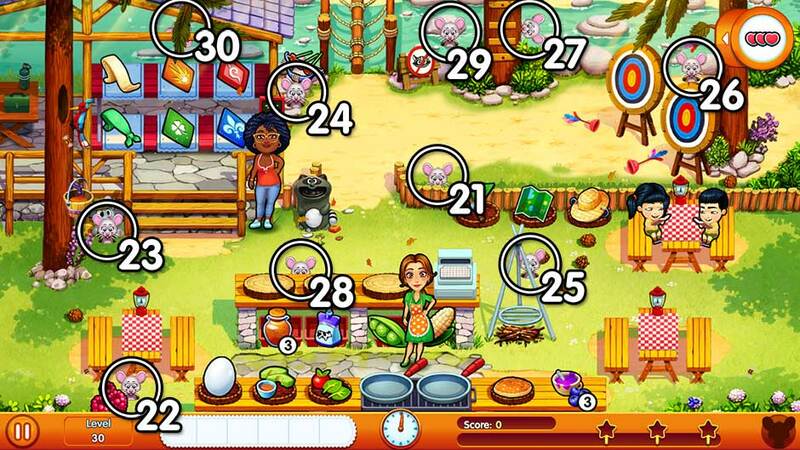 Level 26: Above the lower right archery target in the upper right corner of the screen. Level 27: Peeking out from the right side of the wooden ladder nailed to the tree at the top of the screen. Level 28: Behind the checkout counter, between the first and second mats from the left. Level 29: In the stream between the rope log bridge and the tree with the wooden ladder attached. Level 30: Hanging upside-down between the wood rafters at the top of the cabin, just below the hanging tree branch. 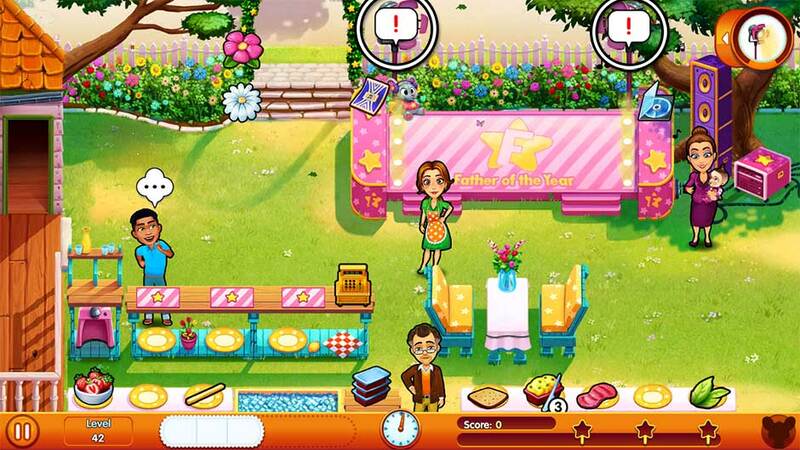 Level 31: On the grass between the left dining table and the tea table. Level 32: On the right side of the path in the upper right corner, in the gate archway. 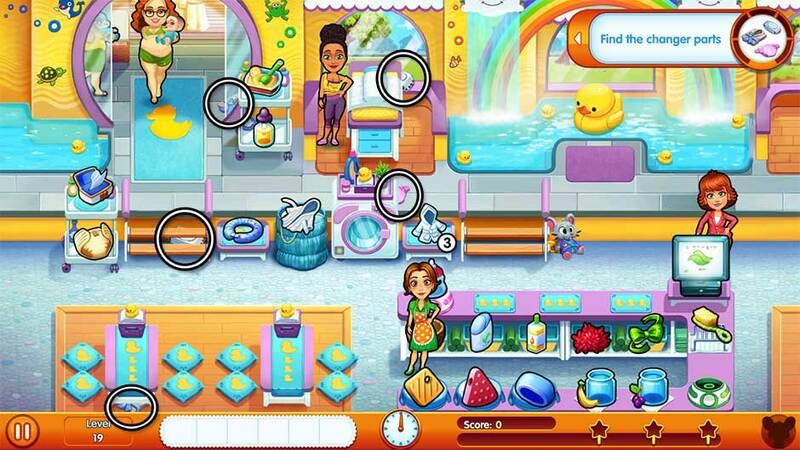 Level 33: Between the cart and fountain on the right side of the screen. Note: Mouse can be covered by customers ordering at the right table. Level 34: Behind the top of the cash register. Level 35: At the top of the leftmost topiary, next to the large hanging sign. Note: Sharon can block the mouse if she’s helping customers take photos. 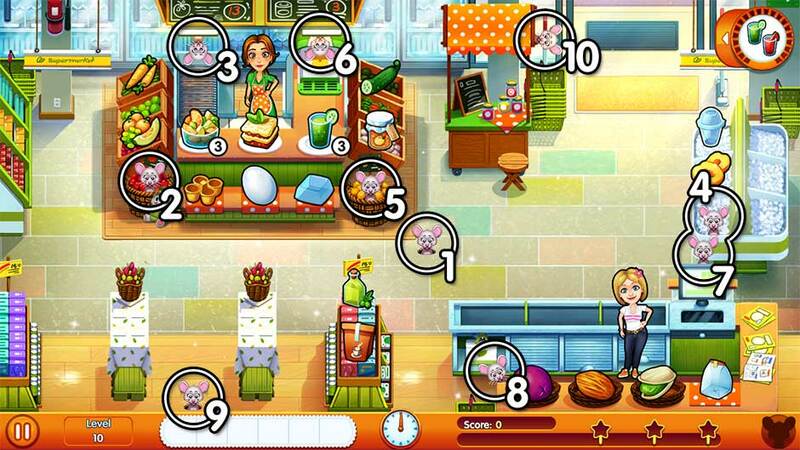 Level 36: On the floor below the checkout counter, between the pastry and the jam. Level 37: Underneath the table in the upper left corner, just above the footpath. Level 38: Behind the top of the small hedge in the lower right corner, next to the champagne. Level 39: In the roses beneath the right window of the manor, above the mask table. Level 40: At the far-left corner of the hedge in the upper left corner of the screen, hiding behind the willow fronds. Level 41: Behind the lower right side of the rose archway. Level 42: On the grass in the upper left corner of the garden. Level 43: On the grass just beneath the center of the stage, centered between the steps. Level 44: On top of the large star on the far-right side of the stage, beneath the CDs. Level 45: Behind the top of the cash register. Level 46: Behind the left side of the checkout counter, above the bag of chips. 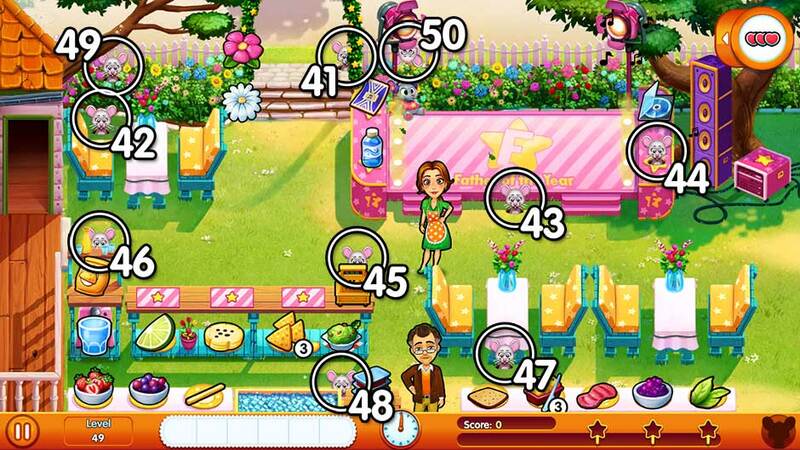 Level 47: On the grass below the first table in the lower right corner, closest to the cash register. Level 48: Behind the popsicle stand immediately below the cash register. Level 49: Behind the left side of the hedge of plants in the upper left corner, below the large tree branch. Note: Orders from the upper left table can partially block the mouse from view. Level 50: Hanging upside-down from the left stage spotlight. Level 51: Behind the third plate from the left of the bottom leftmost counter. Level 52: On the cloth placemat underneath the blue batter tray on the upper right. 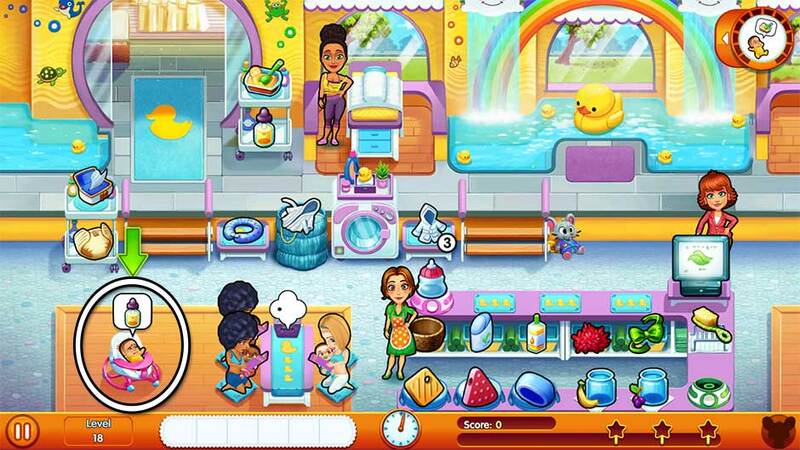 Level 53: In the sink in the upper left corner. Level 54: Between the center and bottom right counters, next to the fondue pot. Note: If you have Mike helping clean, he can completely block the mouse. Only by cleaning a table when the mouse appears will he move out of the way. Level 55: On the floor at the right side of the checkout counter, just below the cash register. 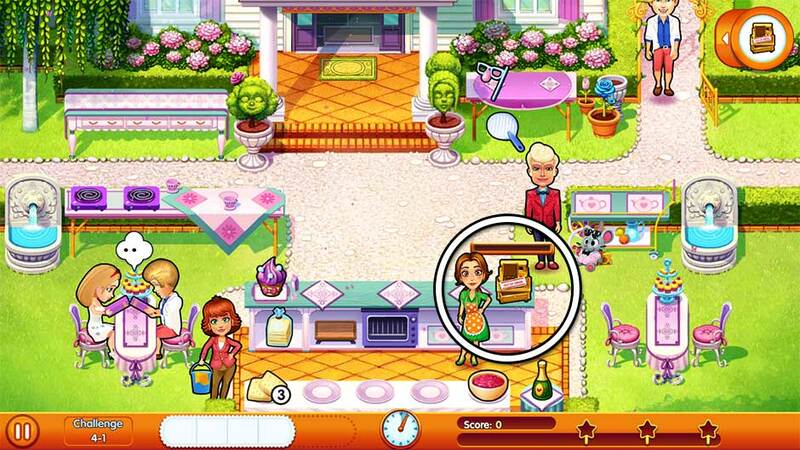 Level 56: In the upper right window, above the batter mixes. Level 57: Hanging upside-down from the center of the spice shelf hanging on the wall between the windows. 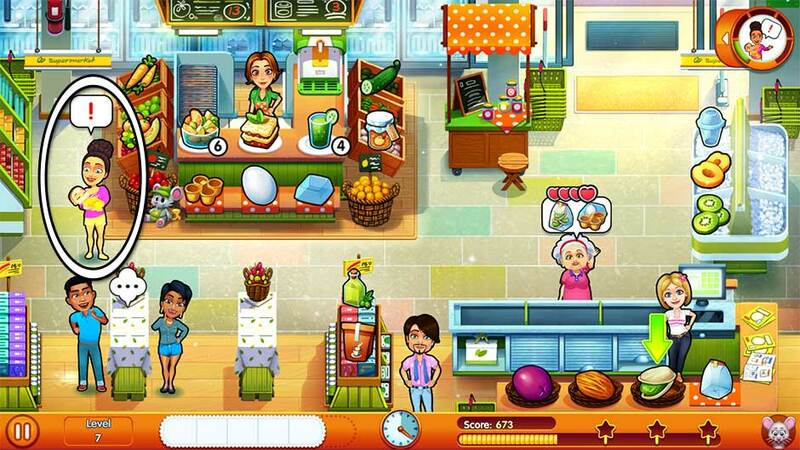 Level 58: On the floor between the bottom left and center counters, between the whipped cream and the glass. 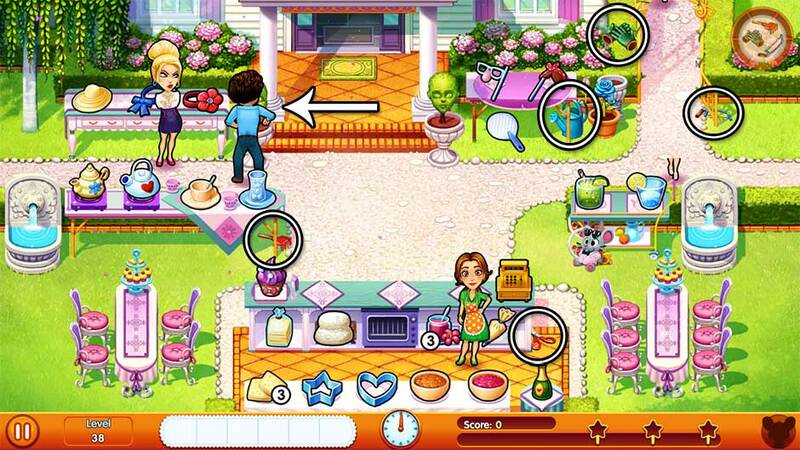 Level 59: On the floor behind the right side of the sink counter, between the bag of marshmallows and the dining table. 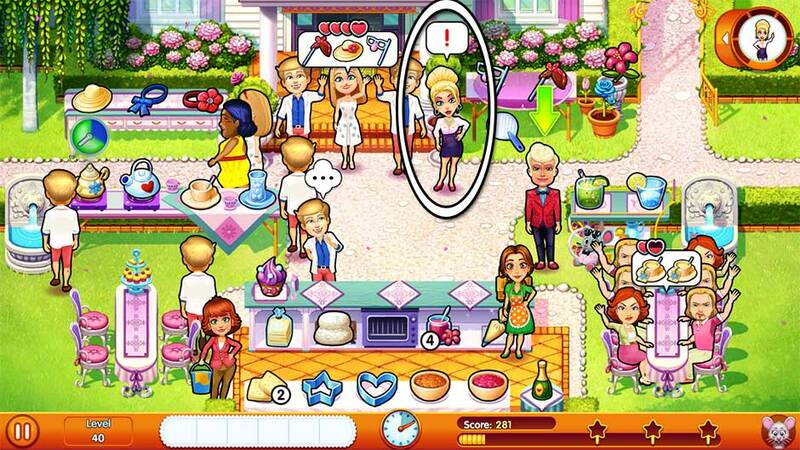 Level 60: Hiding behind the plant in the small blue vase on top of the small oven on the right. Note: Customers at the baking station will block the mouse from view as long as they are there. 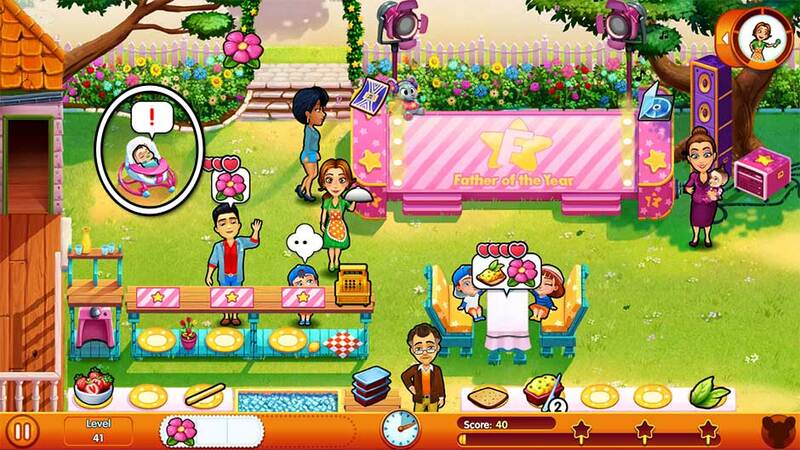 Show off your Delicious – Emily’s Moms vs Dads achievements by earning special trophies. There are 16 trophies for you to unlock. Each trophy unlocks a special postcard, which you can then share with your friends on social media. Click on the trophy icon in the upper right corner of the level select map to view which trophies you’ve unlocked, as well as your progress on unlocking others. Baby Steps Complete the tutorial. Complete the tutorial after starting the game. Time for a Lesson! Complete the first 5 levels of the game. Finish levels 1 – 5. The Parenting Challenge Complete all the levels at The Eco Market. Finish levels 1 – 10. Cleaning the Slate Complete all the levels at the Prenatal and Children Spa. Finish levels 11 – 20. Natural Selection Complete all the levels at Camp Talon. Finish levels 21 – 30. 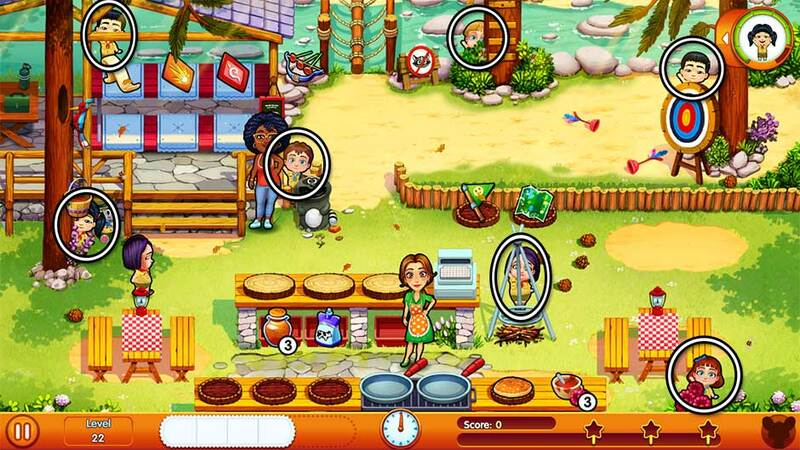 High-flying Rivalries Complete all the levels at Sharon’s Garden. Finish levels 31 – 40. The Final Challenge Complete all the levels at Emily’s Garden. Finish levels 41 – 50. The Father of the Year Complete all the levels at Emily’s Kitchen. Finish levels 51 – 60. Contest Specialist Complete all the story events. Complete all the optional challenges in levels 1 – 60. Personal Shopper Buy every product from every shop. Purchase all the upgrades available in the Shop. 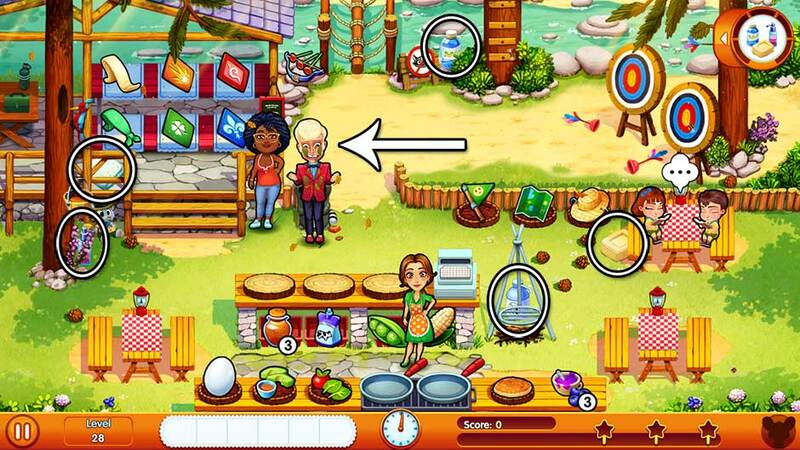 Select the Shop at the beginning of a level, or click the Shop icon at the start of each chapter’s level select map. And The Winner Is… Unlock all the product upgrades across every chapter. Unlock product upgrades by achieving high scores on levels within a chapter. Products will unlock as you play. Mice Catcher Find Carl the Mouse in every level of the game. 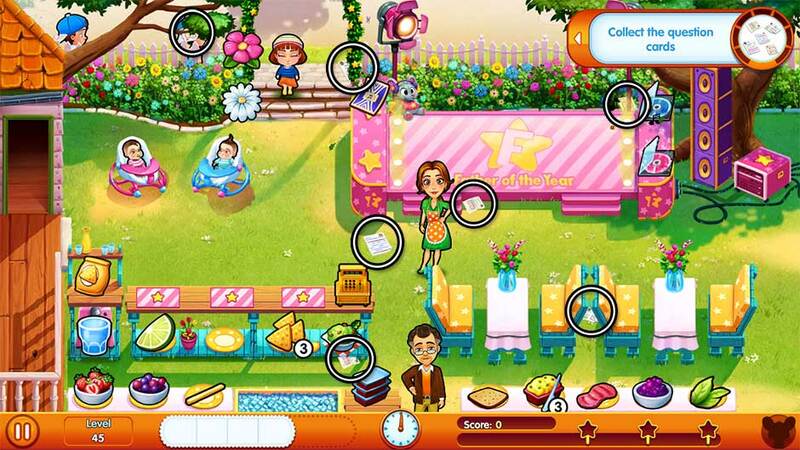 Find Carl the Mouse hidden in story levels 1 – 60. See the Mouse Locations section for a list of all locations where Carl can be found. A Porch Soiree Purchase all the rear porch furniture and decorations. Select the furniture icon in the upper right corner of the level select map. From here, use diamonds you’ve earned while playing levels and challenges to purchase furniture and decorations. Purchase all of the available options to unlock this trophy. 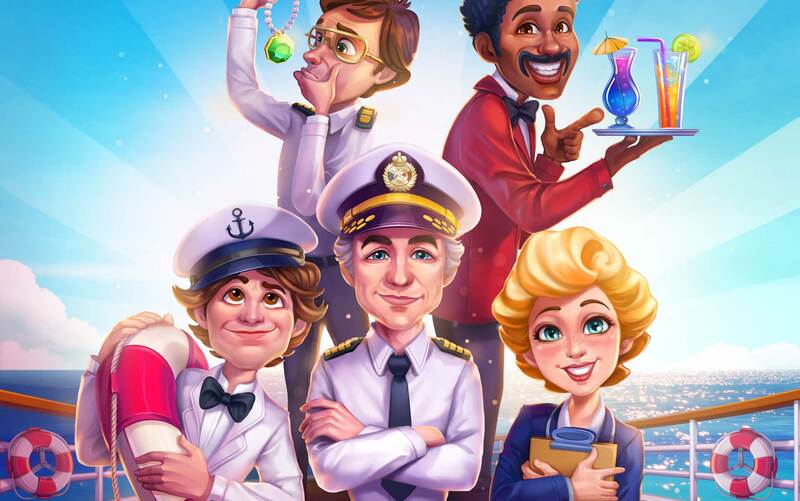 Wish Upon a Star Earn 3 stars on every level of the game. Earn the highest score possible on levels 1 – 60. Sounds Like a Challenge! Earn every star on every challenge of the game. Complete each of the 30 challenge levels successfully. Daily Explorer Have 5 friends playing the game. 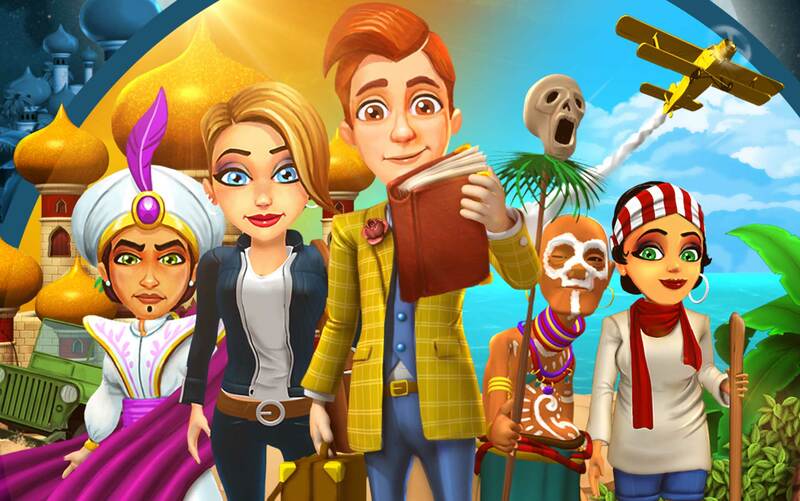 Connect to Facebook and have 5 friends who also play the game. If you need additional help with your game – whether you’re experiencing technical issues or just require a few extra tips and tricks – our Customer Support team can help! Click here to send a support ticket! 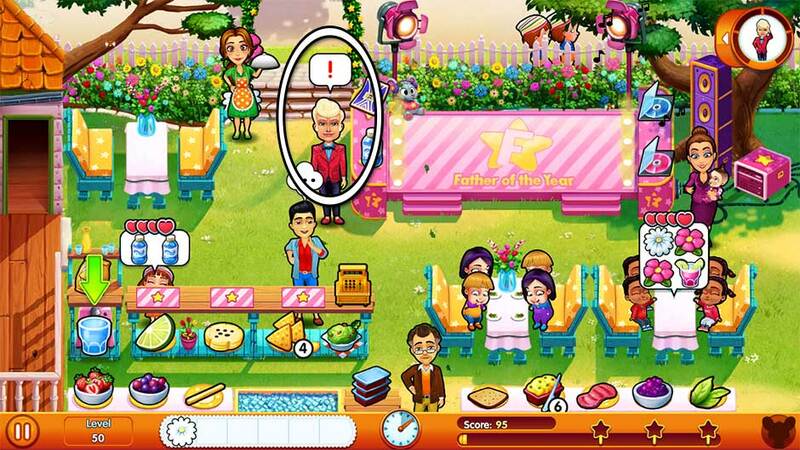 The Delicious – Emily’s Moms vs Dads Official Walkthrough is meant as a guide and does not contain cheats, hacks, or serials.